There's a negative mood in the markets right now. 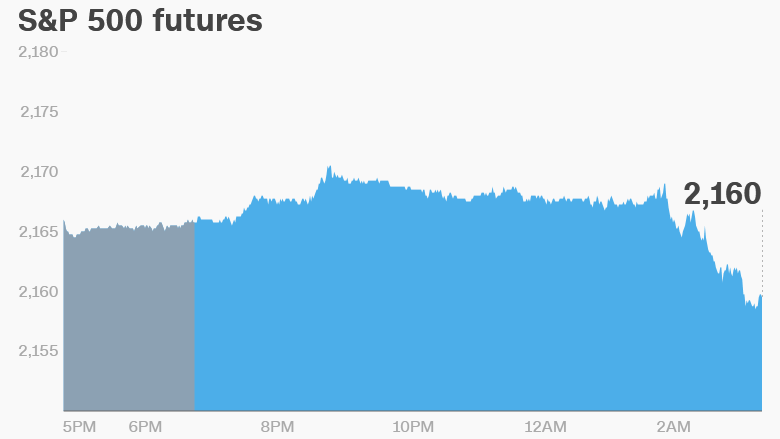 U.S. stock futures are dipping and European markets are all in the red in early trading. 1. Stocks sink, gold shines: Investors seem to have woken up on the wrong side of the bed. They're selling stocks and buying gold. Prices for the shiny metal have surged by 29% since the start of the year as investors seek out a safe-haven asset. Banks in Europe are doing particularly badly. Germany's Commerzbank (CRZBY) is leading the pack lower -- down by about 8% -- after releasing its latest earnings report. The bank warned revenues could slow due to negative interest rates and adverse market conditions. Italian bank UniCredit (UNCFF) is also under pressure. Media reports say Friday's rescue of smaller rival Monte dei Paschi di Siena (BMDPF) has focused attention on its own bad loan problem. 2. U.S. earnings: It's a big day for company earnings. CVS Health (CVS), Aetna (AET), Pfizer (PFE), Procter & Gamble (PG), SodaStream (SODA) and Hyatt Hotels (H) will report ahead of the open. After the close, we'll hear from relative stock market rookies, Fitbit (FIT) and Etsy (ETSY), along with firearm manufacturer Sturm Ruger (RGR). 3. Economic excitement: The U.S. Bureau of Economic Analysis is releasing the latest consumer inflation data for June at 8:30 a.m. ET. This data is closely tracked by the Federal Reserve as it considers future rate hikes. The bureau is also releasing personal income and spending data at the same time. Income has been growing very slowly over the past few months. The typical American family earns about $54,000 annually. Over in Australia, the central bank cut interest rates to 1.5% from 1.75%, as expected. And Japan's cabinet just approved a $277 billion stimulus package for the country. The package is Prime Minister Shinzo Abe's latest effort to bolster the struggling Japanese economy. 4. Vroom: U.S. automakers are publishing their latest sales figures Tuesday. This data demonstrates how confident Americans feel about the economy. Car sales hit an all-time high last year. Consumers are still buying lots of cars, but sales have been trending downward since the fall. International automakers BMW (BMWYY) and Honda (HMC) also reported earnings Tuesday and shares are sinking along with the rest of the market. 5. Oil slick: Crude oil futures are steady around $40 per barrel. Oil prices plunged 4% on Monday, falling below $40 a barrel for the first time in nearly four months. It's now down more than 22% since topping out above $51 a barrel in early June.